Figure 1: A 2-by-2 fiber coupler. A coupler can be used as a splitter to couple out some portion of the light circulating in the resonator of fiber laser, for example. Directional 2 × 2 couplers (see Figure 1) are usually used for such purposes. Dichroic couplers can be used to combine a pump and a signal input for a fiber amplifier, or to remove residual pump light after the amplifier. For high-power fiber lasers and amplifiers, one often needs pump couplers with multiple inputs, combining the outputs of several high-power diode bars. Figure 2: Refractive index profile of a fiber coupler. Both waveguides are single-mode waveguides with a super-Gaussian index profile. The coupling region in the middle is only a few millimeters long. Outside that region, the coupling is negligible, as the mode fields really don't touch each other. 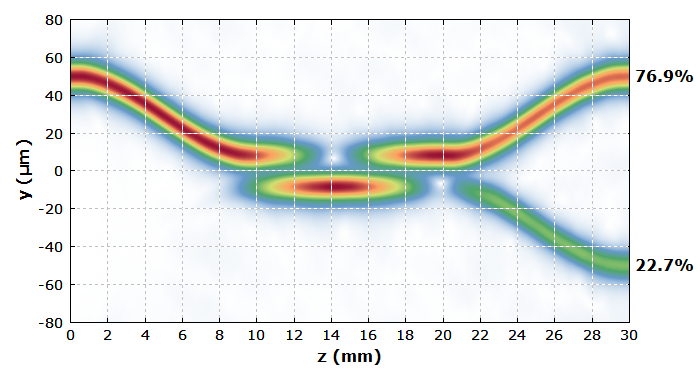 Figure 3: Amplitude distribution in a fiber coupler, obtained with a numerical simulation of beam propagation, done with the software RP Fiber Power. In this particular situation, the light first couples almost entirely to the lower waveguide after a short distance, but then back to the upper waveguide, and finally most of the power remains there. As the coupling strength depends sensitively on the wavelength, for some other wavelengths one may e.g. get nearly all power to cross over to the lower output port. 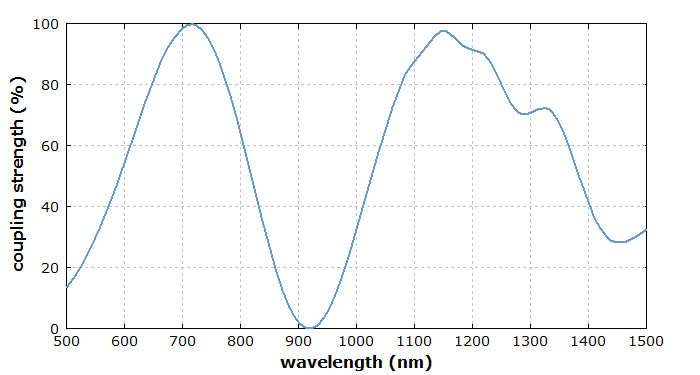 The simulated wavelength dependence is shown in Figure 4. 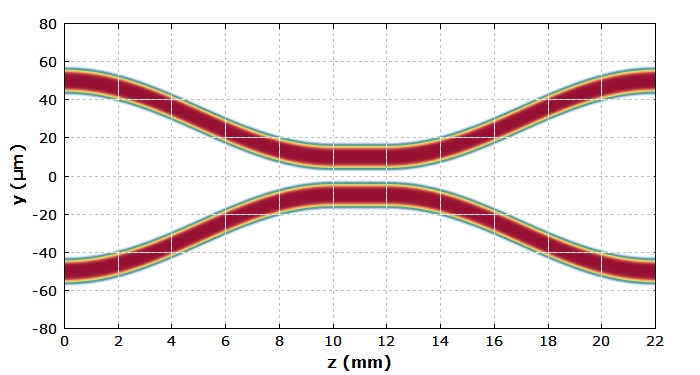 The somewhat strange shape of the curve in the longer-wavelength region results from bend losses of the waveguides, which get substantial in that region. Figure 4: Degree of power coupling as a function of the wavelength. If the coupling is made weak (through the waveguide distance) but can occur over a longer length, the wavelength sensitivity gets stronger. Conversely, broadband couplers require a strong coupling over a short length. Note that such couplers are directional couplers: essentially no light couples into the “backward” direction. Of course, one can inject light into both input ports of such a fiber coupled. The outputs will then be a linear superposition of electric field amplitudes caused by the two inputs, assuming that the optical intensities are not high enough to cause nonlinear effects. Particularly for fiber couplers made from single-mode fibers, one can obtain destructive interference in one of the output ports if two coherent inputs of correctly chosen powers, polarization directions and relative phases are injected. In such a case, constructive interference will occur for the other output port; the overall power has to be preserved, of course, apart from some possible parasitic power losses. Pump couplers for high-power fiber lasers and amplifiers are different in some respects. The input and output fibers are strongly multimode, with large cores and high numerical aperture. The coupling principles can also be different from that in the example case above. For example, instead of evanescent wave coupling one may simply inject light from smaller cores into a large core for the output. Power losses must be carefully minimized – partly because lost light at high power levels might destroy the coupler. Go to Part 9: Polarization Issues or back to the start page.